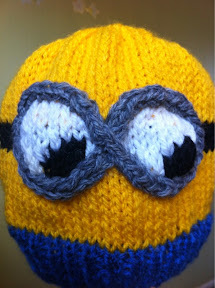 After creating the Minion Hat and Minion Toy, and both being quite popular, I turned my head to the 2 Eyed Minions. Check out both patterns. I’ve made the different so that you can chop and chose various elements for your own unique hat. All my “Despicable Me” patterns are available for free here. Cast on 80 in blue. Rib (k1, p1) 10 rows. Change to yellow and the 5mm needles. Knit as per the chart. The four rows with black should be all black. At the end of the chart, stst 10 rows. Cut yarn, thread remaining stitches onto the yarn, pull to tighten. Stitch around the white eye sections as shown in the image. Stitch up the back, and darn in the tails. The hat fits a child-teenager. Smaller than an adult head anyway.